THE MEMBERS OF the Sullivan Striders scholarship committee joined the seven scholarship recipients for a photo at Thursday night’s Striders meeting at Vino in Monticello. Kneeling in front, from left to right, are Nancy Figueroa, Maryann Manza, Abby Billias and Kim Flynn. Standing in back, from left to right, are Emma Cohen, James Dzurica, Jasmine Walizadeh, Jessica Fingers, Shannon Hornbeck, Greg Lewis, Tom Manza, Dennis Toscano, Roger Hourihan and John Flynn. Missing from the photo are Edwin Diaz and Colin Seidl. MONTICELLO  Seven student-athletes who graduated from Sullivan County high schools back in June are receiving some help in paying their college tuition from the Sullivan Striders Running & Walking Club. The Striders awarded a total of $3,000 in scholarships to those seven young men and women on Thursday night at Vino in Monticello. 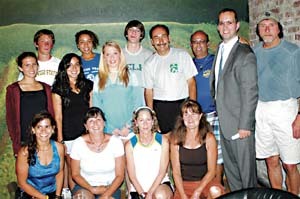 The scholarship ceremony was held in conjunction with the Striders’ regular club meeting. Each November, the Striders hold the Falling Colors 5K Run/Walk in Rock Hill. The club uses the race proceeds to award scholarships to deserving student-athletes the next summer. The Striders are already preparing for this year’s Falling Colors 5K, which will be held on Saturday, Nov. 7 at Emerald Green in Rock Hill. Earlier this year, 14 high school seniors from around Sullivan County completed the Striders scholarship application. The nine members of the Striders scholarship committee  Abby Billias, Edwin Diaz, Nancy Figueroa, John Flynn, Kim Flynn, Roger Hourihan, Maryann Manza, Tom Manza and Dennis Toscano  then selected the seven winners. Those seven scholarship winners are Emma Cohen, James Dzurica, Jessica Fingers, Shannon Hornbeck, Greg Lewis, Colin Seidl and Jasmine Walizadeh. Toscano, who is the Striders President, welcomed the athletes and their parents to the meeting. Toscano also praised scholarship committee Chairperson Maryann Manza. She was quick to point out that she receives a great deal of assistance from all of her fellow scholarship committee members. Each of the scholarship recipients was then introduced by a scholarship committee member. Maryann Manza noted that unfortunately Seidl, a Sullivan West graduate who will attend Sacred Heart University, was unable to attend the ceremony. Among Seidl’s accomplishments during his scholastic running career were setting a national best time of 9 minutes, 25.2 second in the 3,000-meter steeplechase back in May and winning the New York State Public High School Athletic Association (NYSPHSAA) Boys’ Division II 3,000-meter steeplechase championship in June 2008. Maryann Manza introduced Lewis, a Livingston Manor graduate who will be attending SUNY Delhi. Lewis ran for the Wildcats’ cross country, indoor track and outdoor track teams from 2005 to 2009 and received the cross country team’s MVP award. He also ran in several local benefit races. Tom Manza introduced Fingers, a Monticello graduate who will attend Columbia University. Manza read a letter that Monticello guidance counselor Joe Seidl sent to the scholarship committee. In the letter, Seidl stated that Fingers is “a role model for other young people.” While running for the Lady Panthers’ cross country, indoor track and outdoor track teams, Fingers set seven school records. She also graduated with a 3.69 gpa. Tom Manza introduced Shannon Hornbeck, a Tri-Valley graduate who will attend Siena College. He read a letter that T-V girls’ cross country and track and field Coach Missy Iatauro sent to the scholarship committee. In the letter, Iatauro said that Hornbeck “had a tremendous work ethic” and was willing to do whatever she could to help the team. Hornbeck qualified for the NYSPHSAA cross country meet three times in her scholastic career. Among her other accomplishments were setting personal bests in the 1,500- and 3,000-meter runs this past outdoor track season, winning the T-V Coach’s Award for cross country in 2008 and being named the T-V indoor track MVP for the 2009 season. Hourihan introduced Jasmine Walizadeh, a Liberty graduate who will attend St. John’s University. Hourihan read a letter from Liberty track and field Assistant Coach Debbie Simpson. In the letter, Simpson stated that Walizadeh’s “determination and drive allowed her to compete at the highest level.” Walizadeh graduated second in her class with a 97.63 gpa and earned 32 credits, which is 10 more than the number needed for an Advanced Regents Degree. In her varsity career, Walizadeh earned the Most Improved and MVP awards for the Lady Indians’ track and field teams and was named the MVP of the girls’ soccer team. Billias introduced James Dzurica, a Monticello graduate who will attend Oswego State University. Billias read a letter from Monticello indoor track Assistant Coach Paul David. In the letter, David noted that Dzurica “is a very determined athlete” and was “always willing to spend time with other runners helping them with their technique.” Dzurica, who was a four-year member of the Panthers’ varsity cross country, indoor track and outdoor track teams, earned the 2009 male Orange County Interscholastic Athletic Association (OCIAA) Scholar Athlete award for Monticello. John Flynn introduced Emma Cohen, a Monticello graduate who will attend the College of St. Rose. Cohen, who graduated with a 3.5 gpa, was a four-year member of the Lady Panthers’ cross country, indoor track and outdoor track teams. Among her accomplishments were earning the Coach’s Award for cross country in her sophomore year and track in her senior year and setting a new school record in the 2,000-meter steeplechase during the 2009 outdoor track season. She also actively served her community by participating in food drives, toy drives and fundraisers for the United Way.